The HR assessment questionnaire consists of 154 questions divided into 6 sections: information about the company, HR practices, Personal growth, Engagement, Wellbeing and Leadership. The Employee Engagement & Satisfaction Survey is composed of 36 questions divided into 8 sections: Employee Profile, HR Practices, Leadership, Compensation & benefits, Corporate Social Responsability, Employee engagement, Personal growth and Workplace. The employee survey consists of 36 questions divided into 8 sections. The HR Assessment consists of 154 questions divided into 6 sections. 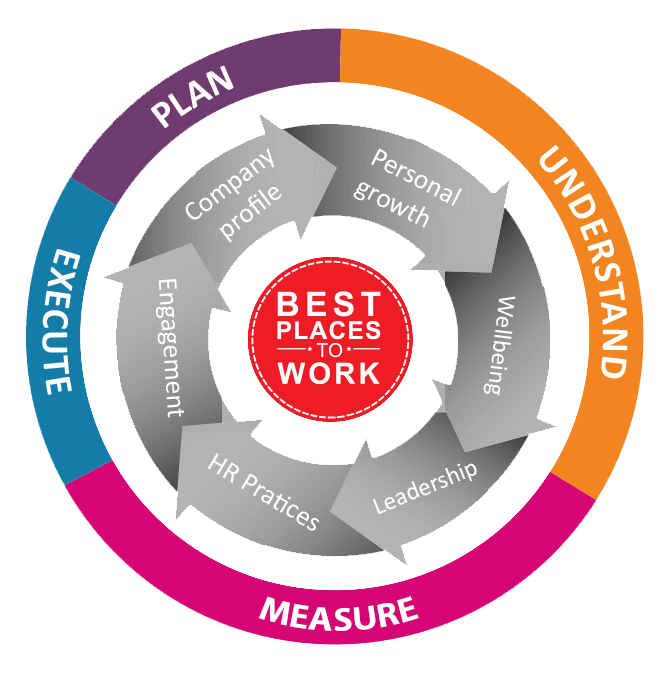 Measuring employee engagement is the key aspect of the program. 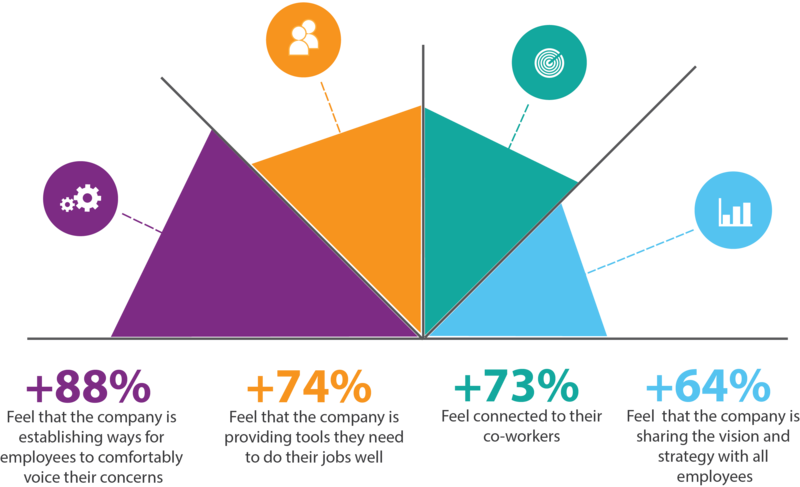 The employees opinion at all levels of your organization are measured, giving you a multidimensional view of the current situation and clearly showing the areas you need to address to improve your employee engagement. The ultimate goal is to trigger a transformation of your organization’s culture. The important thing is to help organizations understand the results and benchmark them so that they can reflect on ways in which they can improve engagement and employees trust over the long term. Who runs this program ? This program is an initiative of the American Institute “Best Companies” in several countries in the world. How much time will we devote to this program ? What happens if our organization is not on the list of best places ? 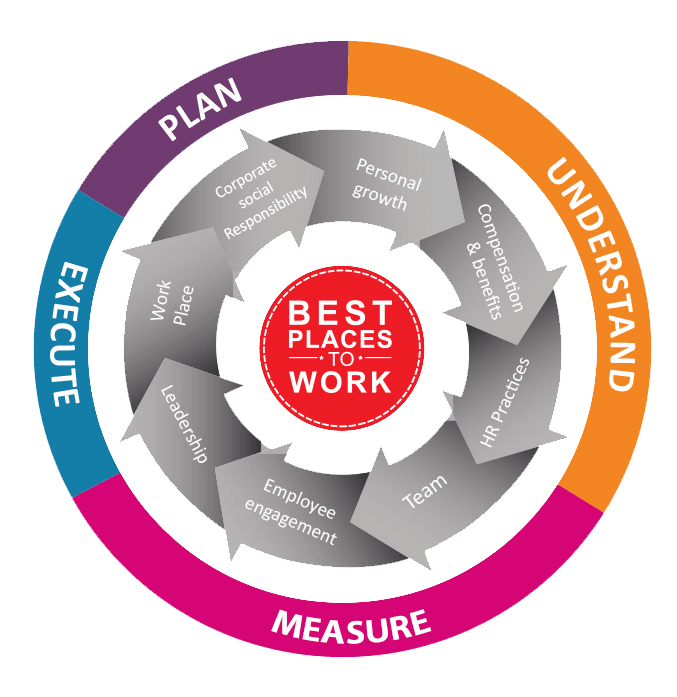 Participating organizations that are not selected for the “Best Places To Work For” program will not be identified and their names will not be disclosed or made public in any way. Is it possible that other companies only distribute surveys to their most satisfied employees ? The survey links are distributed randomly. Firms that do not comply with this instruction are immediately disqualified. Who is eligible to participate in the program ? Any organization with 15 or more employees, with more than two years of existence. What indicators are considered in the program ? The program focuses on different HR aspects including: Employees conditions, compensation and benefits, motivation, evolution, training, development, wellbeing, leadership and HR practices. What about data confidentiality ? The employee survey process is completely confidential. All surveys are anonymous and when completed, they are sent directly to our system, which collects and analyzes the data. How many questions does the employee survey include ? The employee survey consists of 36 questions, with 2 open questions towards the end. How many questions are in the HR Assessment ? The information exchanged is confidential and remains a concern for employees who are asked to objectively express their opinion about their employer. To this end, best efforts are made to avoid any perception of breach of confidentiality. All employee data is submitted anonymously. Employees who respond to the online survey will receive an invitation from the Survey Administrator info@bestplacestoworkfor.org with a personal identification URL. This link, generated at random by the system, is unique to each respondent and can not be used to identify anyone. During the survey administration period, employees can access and resubmit their questionnaires. Employees who respond to the paper survey will be assigned response envelopes. The organization will collect employee answers in sealed envelopes that will be analyzed in the same manner as the online surveys.